The Quonochontaug House in coastal Rhode Island is located three hours from New York City and is built as a retreat for a family from Brooklyn. 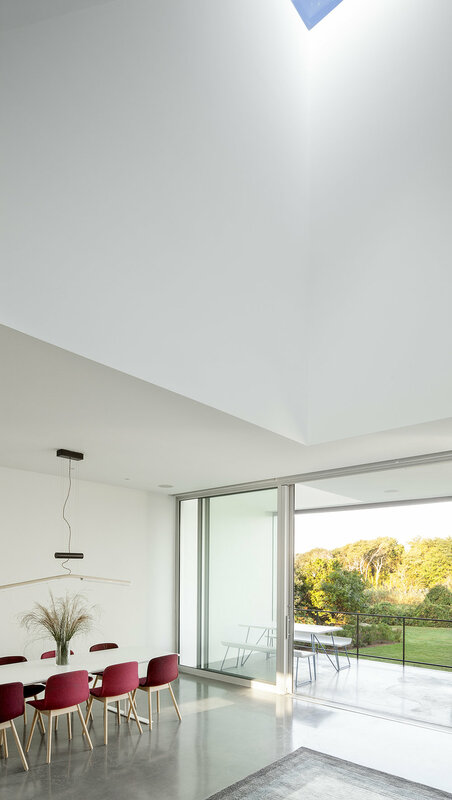 The design is organized around an open-plan ground floor punctuated by a series of double-height sky-lit spaces that progress from entry to bay view. 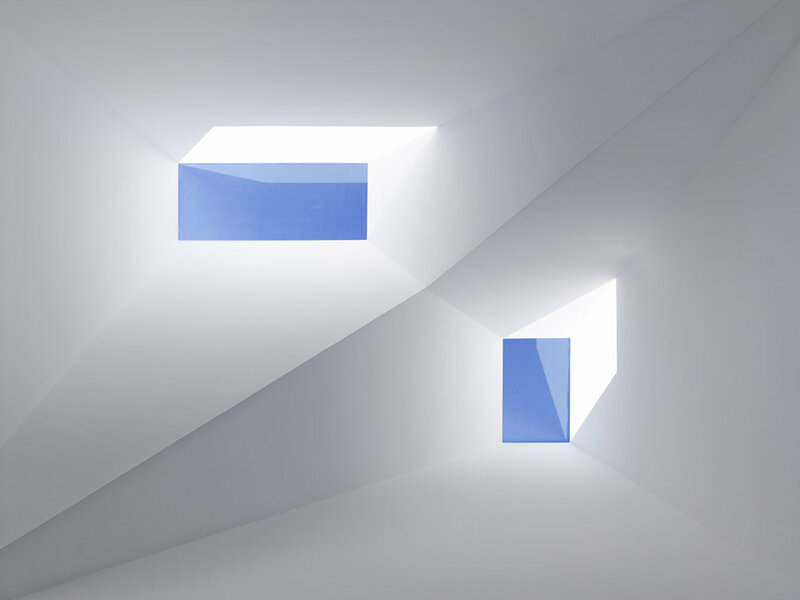 The light volumes alternate around an east-west axis defined by a pool terrace (to the east) and the ocean bay (to the west). They taper at their apex for precise views of the sky above and provide shifting and ephemeral natural light patterns throughout the day, varying across seasons and according to changes in the sky and weather. 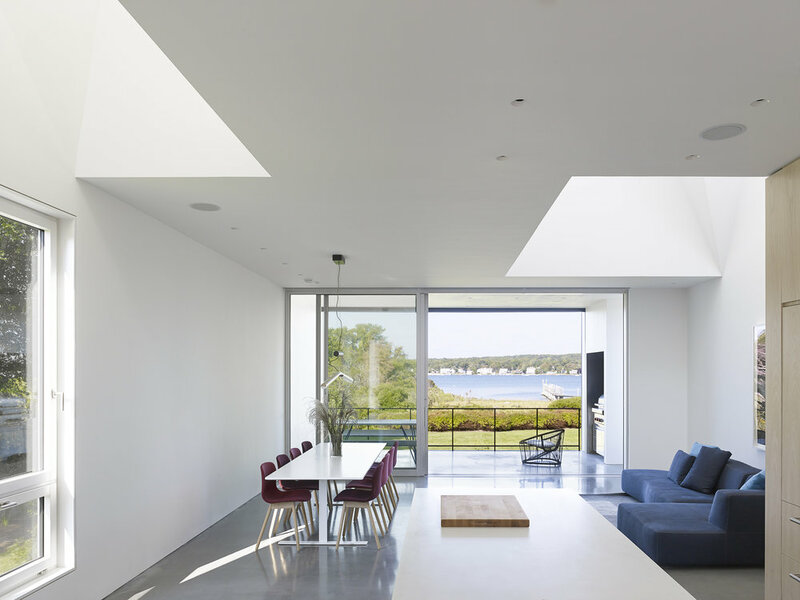 As those who dwell in New York typically experience light, shade, and color as an exterior experience, this house harnesses an opportunity to allow sunlight (and moonlight) into the deep interior of a house as something unfamiliar. 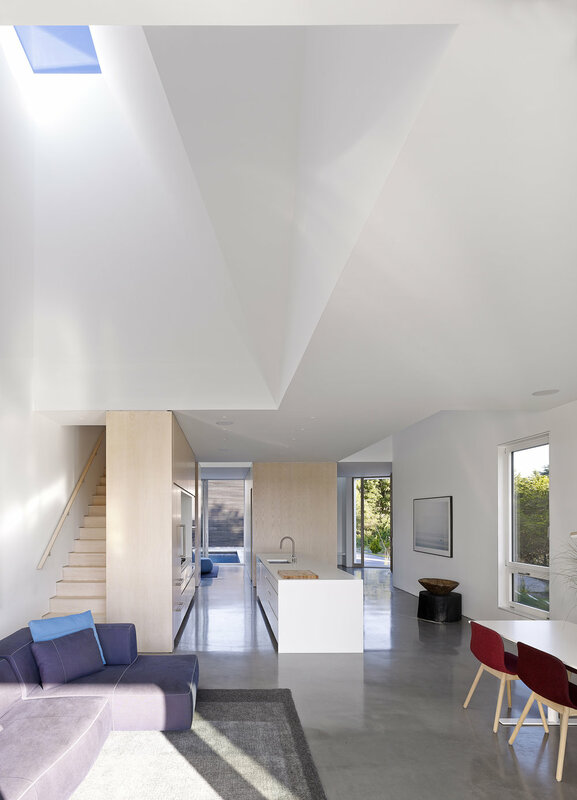 The house embraces experience of the sky, of light from above, one that the owners do not get from their interior experiences of the big city. And this experience is meant to be pervasive, not binary (“day/night”, or “dark/light”). Light is subtle, constant, in terms of colorization and in terms of luminosity. Thus the house changes at any given hour depending on where clouds are, where the sun is, whether the moon is full, new, or waxing, and whether it is spring, summer, autumn, or winter. The interior space is delineated by a cluster of ashwood-clad boxes in which all building services are enclosed. The exterior of the house is clad in Shou Sugi Ban, milled slats of cypress which have been charred, brushed, and oiled. These slats require virtually no maintenance over their lifespan and present a stark contrast to the light-bathed interior of the house. 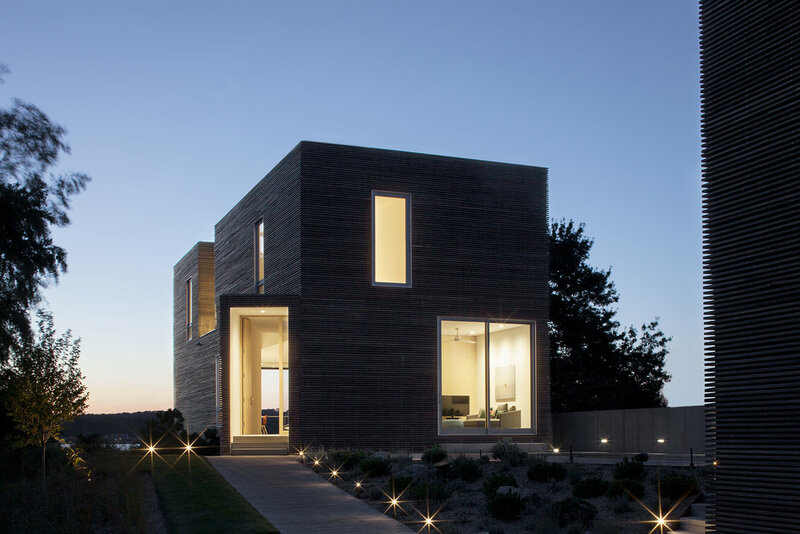 This project has won a 2016 AIA NYC Chapter Design Award in Architecture, a 2015 Emerging Architecture Award from the Architectural Review, a 2015 AIA National Small Projects Award, a 2015 SARA Design Award, and was also featured as the May 2015, Architectural Record House of the Month. The house changes at any given hour depending on where clouds are, where the sun is, whether the moon is full, new, or waxing, and whether it is spring, summer, autumn, or winter.